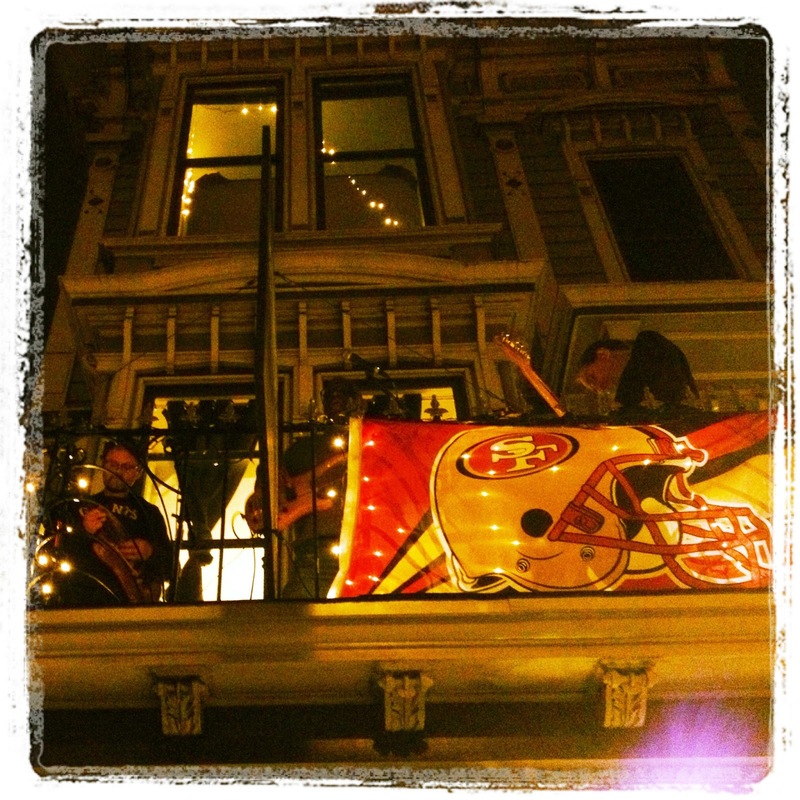 They were playing “My Favorite Things” from The Sound of Music, only in light-rock fashion. But how does this relate to food and tacos, you ask? After perusing the art walk for a bit, Chanda and I stopped in to Estrella’s Taqueria so she could grab a late dinner. She got a Super Taco, and was raving about it the entire time she was eating. I swore I’d go back one day and get a taco of my very own. Luckily I didn’t have to wait too long. Two days later I found myself in Estrella’s again, and there was no question what I was going to order. I ordered a Regular Taco (not a big sour cream fan), which consisted of salsa, grilled chicken, two soft tortillas, and cilantro. Also, it was perfect. The tomatoes in the salsa were so refreshing against the grilled chicken, which was grilled well and wasn’t burnt. They didn’t skimp on anything. In fact, I could have used three tortillas instead of the two they gave me to hold all of the other ingredients! My taco kind of exploded. Whoops. That’s what forks are for? 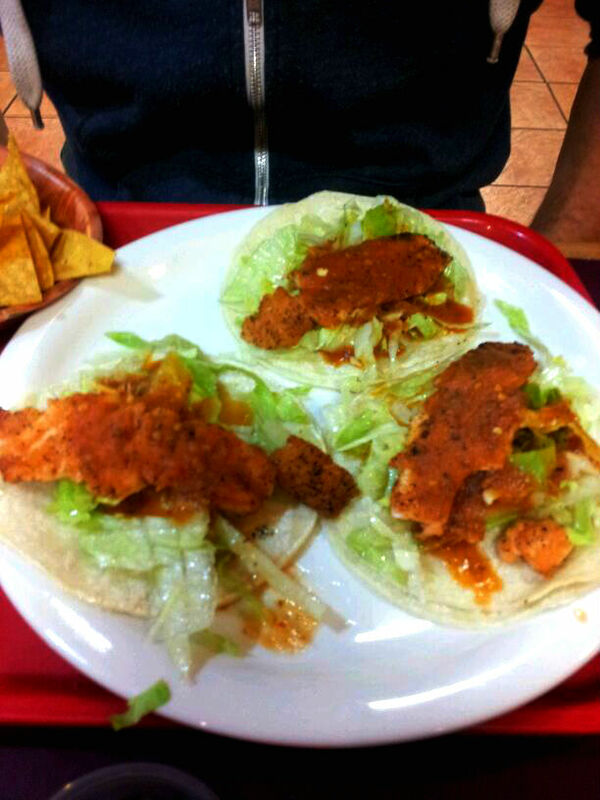 Nick got the Spicy Fish Tacos, with fresh lettuce and the spiciest salsa ever! They were quite delicious. If you’re not a spice wimp like I am, you’ll love these. They were demolished very quickly. I would definitely recommend Estrella’s to anyone craving Mexican. They’re super affordable, use fresh ingredients, and don’t put any mystery fish sauce on your tacos. Bonus points: when you’re done eating, you’re in an awesome neighborhood. At this point you’re probably thinking this girl must have had her taco fill for a while. But you’d be so wrong! 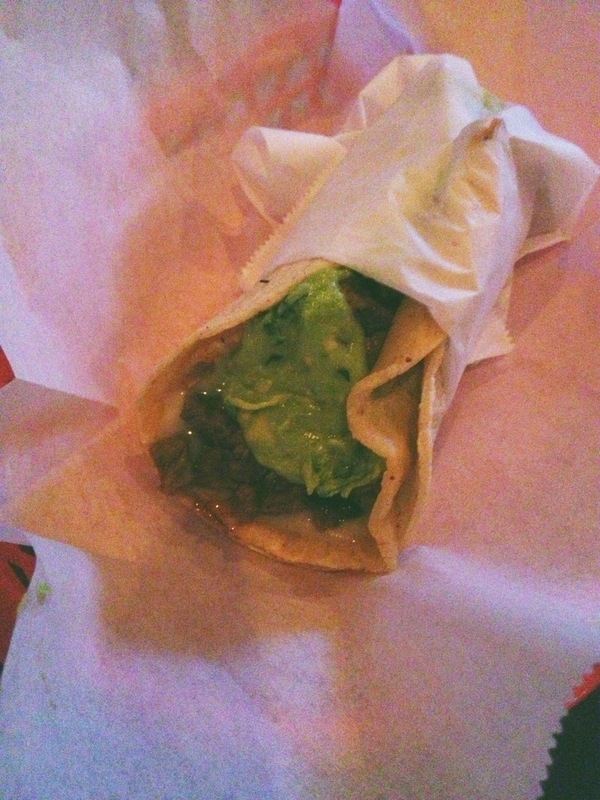 Because the next night was a Tuesday – as in Taco Tuesday. And we were already at The Taco Shop at Underdog’s. Underdog’s is a unique fusion of Mexican food with a Bay Area sports bar. Pretty genius. They have 10 plasma TV’s and are always packed – which is a great sign. What’s more, the famous Nick Fasanella (of Nick’s Crispy Tacos on Polk), is the chef mastermind here. I got a Carne Asada Taco, “Nick’s Way,” which means that your taco ingredients come inside a grilled crispy tortilla, which in turn is wrapped in a soft tortilla. This is awesome because it takes away the age-old dilemma of “should I order a soft taco or hard-shell taco?” With Nick’s Way, you can relax and just enjoy your hybrid meal. Also in my taco was a heaping helping of guacamole (bonus points there), as well as Monterey jack cheese. Very, very good. 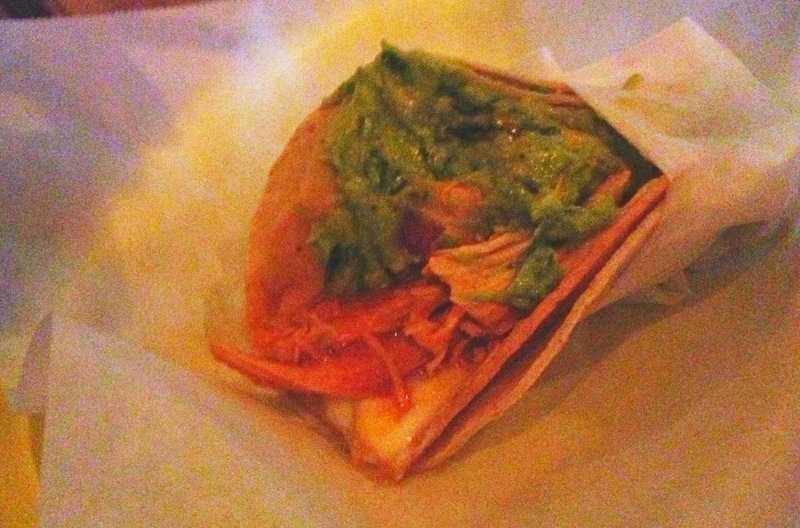 Becca ordered the Chicken Taco, Nick’s Way (read: both hard-shell and soft tortilla). Hers came stuffed with grilled chicken, a heaping of guacamole, pinto beans, and Monterey jack cheese. Pro tip: On a slow night, if you’re really nice to the staff they let you order California-style burritos and quesadillas, which means they put french fries in your order. This is the best ever. But it is rare. Estrella’s Taqueria and The Taco Shop at Underdog’s may seem similar in cuisine but comparing them really is like apples and oranges. 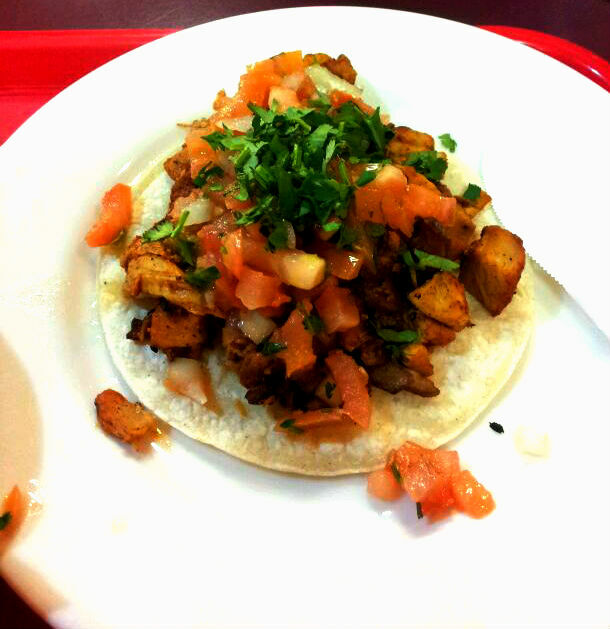 Estrella’s is a small taqueria, with a very calm, genuine feel and fresh simple ingredients. Underdog’s, with it’s basketball machine and sports fans, is a much more lively scene, and the food is greasy (as you would expect from a sports bar). Both are great, depending on your mood and what kind of night you’re having. I personally would lean towards Estrella’s for the food itself and Underdog’s if you’re trying to play or watch some games. Try both and find out which one you prefer!